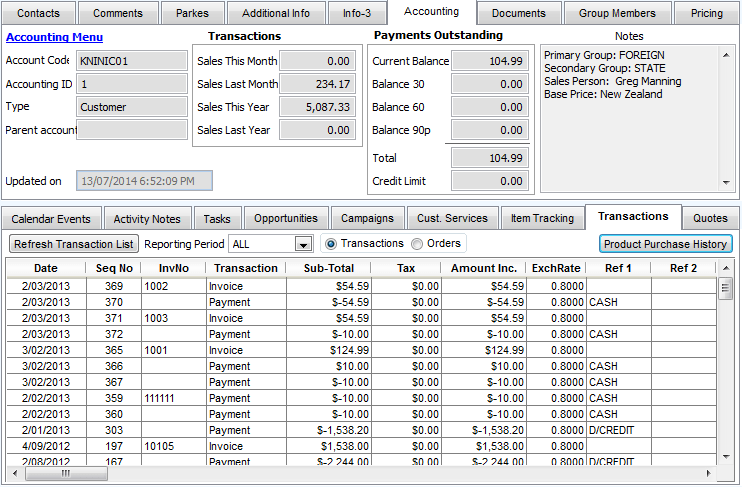 Being able to access to your accounting information from inside your CRM is essential for your team. It helps your team respond to customer queries and makes it easier to pursue up-sell opportunities. Legrand CRM was designed with a deep understanding of the value this information can provide to your business. Our seamless integration with various accounting systems provides quick and easy access to financial summaries and sales transactions directly within Legrand CRM. The Financial Summary screen shows customer sales figures for the current month, last month, current accounting year and last accounting year. Also included are the aged receivables and the Notes fields from the accounting system. Highly targeted emails produce the best results! Increase customer loyalty and satisfaction with personal messages that thank customers for specific milestones. For instance, use our accounting integration to quickly retrieve all the customers that spent more than, say, $5,000 last month and send them a thank you message, or quickly retrieve all the new customers in the last 3 months and send a message with a discount voucher to encourage a second purchase. Legrand CRM’s e-template editor lets you create email merge templates that will source data directly from your company and contact records. Templates can be as short or as long as you need. Use templates for simple ‘Thank You’ emails or more complex queries for feedback and quotes. 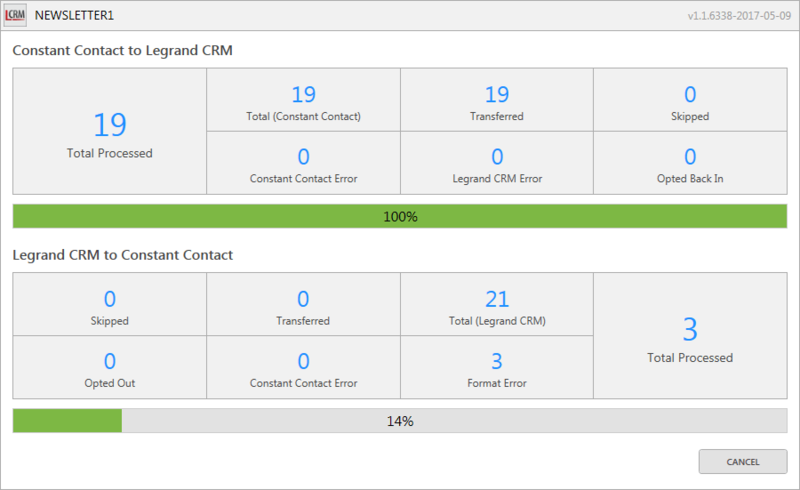 Send emails to individual contacts or contact groups directly from Legrand CRM using one of your configured e-Templates. Emails are sent using your own email server and the content of the email is automatically stored as an Activity Note in Legrand CRM. This works great for small lists containing a couple of hundred of contacts. If you wish to send an email to thousands of people, we do recommend that you use an email service provider which is developed specifically to accommodate large email distributions. Take your mail integration with Legrand CRM to the next level with our Outlook AddIn. The Outlook AddIn works directly within your Outlook application. You can immediately action an important email straight from Outlook – whether this is a hot new lead or an urgent request from a major customer. The Outlook AddIn makes it easy for your team to keep your CRM up-to-date with the most pertinent information from your clients or leads. Quickly transfer emails from your Inbox to Legrand CRM and make it a part of your customer’s history. Quickly create new contacts in your CRM directly from Outlook. Our Outlook AddIn doesn’t only work in one direction. Aside from offering you a quick way to add to your CRM history and create contacts – you can also see important information about your existing clients directly in Outlook. See recent Activity Notes, incomplete tasks, upcoming calendar appointments, linked opportunities and a summary of the contact’s title, contact information and business. Legrand CRM integrates with both Constant Contact and MailChimp – global leaders in email marketing services. Legrand CRM’s strength in list management enables you to create highly targeted campaigns aimed at specific contacts in your database. Use our Campaigns module to create an e-mail campaign using target lists you have created directly in Legrand CRM. Our integration allows you a straightforward platform where you can upload and synchronize target lists with your chosen email service. After the email has been sent, the response tracking is downloaded seamlessly to Legrand CRM and retained permanently. Both summary and detail results are recorded in your CRM. When you look at a campaign in Legrand CRM you’ll immediately see the summary result, as well as see the detailed result for every individual in your mailing list. The Campaign Sync feature comes as a standard part of your subscription to Legrand’s On Premise CRM. Easily setup your connection to either Constant Contact or MailChimp using our provided installer. Follow the steps provided in our support library to establish your connection.